The Desert Caballeros Western Museum in Wickenburg, Arizona, recently added Josh Elliott's oil painting Rurality to its permanent collection. The 22-by-44-inch landscape scene was unveiled at The West Select invitational exhibition held last November at the Phoenix Art Museum. Of the acquisition, W. James Burns, Ph.D., director of the Desert Caballeros Western Museum, states: "Elliott has advanced from a rising star to a mainstay in the Western art world; the museum would be remiss in not having one of his works in the collection. The museum's art acquisition committee was struck by the juxtaposition of the built environment against the mountains. This scene is ubiquitous throughout the West; visitors identify with it even if they haven't been there, and the piece has wonderful interpretive value." 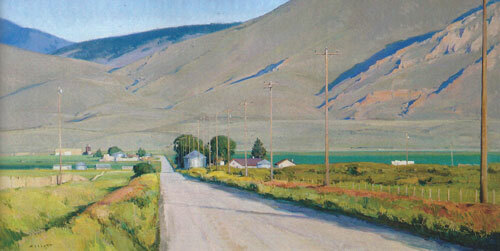 Elliott, an award-winning artist who hails from Montana, draws his inspiration from nature. He learned the fundamentals of his craft from his father, wildlife artist Steve Elliott, who also instilled the importance of painting outdoors. Of Rurality, Elliott remarks, "As much as a statement on living beyond the outskirts of towns and cities, relying on the land for your living and feeding the world, Rurality is an exploration of color harmonies and being intentional with the key signature. I paint with the goal of painting a picture that is pleasing to the eye, it's a bonus when i can inject a bit of a story into it!" The frame for Rurality was designed by Elliott and master furniture maker Al Swanson, who also built it. "I consider the frame itself to be a piece of art," says the artist."